Discussion in 'General Scientology Discussion' started by Mimsey Borogrove, Jul 21, 2016. This is the thread where you can post all of your Oat Tee wins. We wanna hear about those found parking spaces, the telepathic phone call premonitions, the postulating of rain clouds and finding the car keys in your other hand! Tonight, at the designer hamburger joint / tavern, I wanted some of their beer batter onion rings. I asked our nice (and cute) server about the size of the burger I was ordering. Big, she said. Really big? Yep, really big. And it was, "however", I thought, "I can still go with some rings." 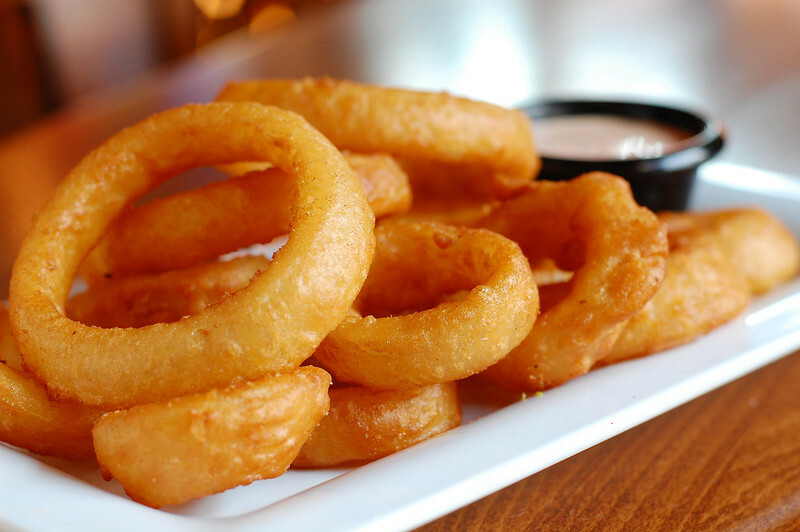 When another server dropped off my wife's salad, I asked him for some onion rings. I took a big bite of my burger, licked my lips, and bit off another then he plopped down an order of rings on the table. Wow, I thought - that was fast, and yes, they were delish! So, after sharing a slice of key lime pie, when we got the check I noticed they didn't charge me for the rings. So I asked the sweet girl, "Why didn't I get charged for the onion rings?" "Oh! They were made for someone else by mistake, so the other server gave them to you." "For free?" I asked. "Yes" the darling girl said. Is that OT or what!!!! Top that if you can. Last night I forgot to close the garage door when I got home. An hour later I realised I'd left my laptop in the car, so I went to the front door & looked out & saw that the garage door was already open, so I just walked through the garage (without having to open the door) & went to my car (which was also still unlocked) & opened my car. My knowingness must have made me forget to close the garage door because my knowingness realised I'd also forgotten my laptop. Quickly read the thread title and wondered what ESMB thread they had won. Oh dear coffee hasn't kicked the remaining brain cells into action. There was an old win about being able to feel bacteria on the skin, when I searched for it it was about Super Power. Between the two wins, I am more swayed by the wins to do OT than Super Power, onion rings aren't likely to send you insane. I just returned from my out-of-town vacation, and stayed at the 5 star hotel I frequent. Everyone from the GM to the restaurant hostess, and all the doormen know me, as does the bartender and concierge and front desk staff. I spend thousands of dollars there every time I stay. During my first week there, I decided to have a drink at their bar, and was enjoying talking to the bartender. Well, I got up and tried to pay after I'd finished my drink, but he said it was complimentary! And I'm not even OT! I decided that I'm a Natural OT. I could see that I had improved conditions throughout the hotel, and all my postulates were happening! OT power to control traffic signals. Ha! Way back in the 1970s I had heard of one SCN staffer that claimed he could mentally control a traffic signal as he approached the intersection to turn to green. I thought that this was weird but didn't think much about it at that time. Many years later, after blowing from SCN and becoming a software engineer, I eventually became involved in developing products for traffic control and U.S. NEMA NTCIP standards. What they were really experiencing is called "traffic signal coordination". No OT powerz are involved. I stopped at a traffic light that had turned red. I waited for it to change an inordinately long time but it was in a stuck condition. Not wanting to commit any overts against the Way to Happiness by breaking the law and going thru the intersection, I waited several hours without any joy. Then I cognited that I should use Ron's tech! I immediately spotted that I was in "waiting" on the know to mystery scale and that blew a ton of by passed charge. Then I realized that I could use postulates to make it go right. I made a tone 40 postulate that the light would change to green. It did change to green and I drove thru. Scientology works! I also cognited that it is important to include in ones postulate a time factor. Because it took another 8 hours before the street maintenance crew arrived and fixed that light and I missed an entire day's work. The next time this happens I will remember that wogs have a terrible com lag before they duplicate the postulates of an OT. Oat Tea wins? I have loads of them. Stuff happens all the time. Like I go to the supermarket to buy bread and they always have some. I know that is because my Oat Tea-ness is working. Cause over bread, ya know. Win!!! I am so Oat Tea that when I hang curtains, they hang. Cause over curtains, ya know. Win!!! The other morning I had a small episode with a mouse in the house. I’d just gotten up and was sitting here contemplating my day whilst waiting for my first cup of coffee to kick in. I saw a mouse run across the room. I sat here, with my feet up on the coffee table, thinking “go away mouse, go away”. And it did ya know. It ran away! Cause over mouse-in-the-house. Win!!!! So Oat Tea! I went to Starbucks and was thinking I wanted a Caramel Waffle Cone Frappuccino. As I walked up to the counter the girl looked at me and said, "Caramel waffle Cone Frappuccino?" My intention was so strong she picked up my immensely powerful OT theta waves in her wog brain! My friend I was with said, "You get that every time we come in here." But just between us here on ESMB we KNOW it's actually my intensely powerful OTea powerz that radiate out like a beacon. Thank you, LRH and COB, this is even better than finding a parking space. Didn't have anything to do with your pump action shotgun, did it? Tonight I came home with a six pack. No, it's the kind you put in da fridge. Missus asked me...."did you buy beer tonight?.".
" 'ken oath", I says, but telepathically. So I give her a look - the Oat Tee look. Wow! It sounds like you were calling upon your inner Tommy Davis? Oat Tea wins? I have loads of them. I am so Oat Tea that when I hang curtains, they hang. Cause over curtains, ya know. Win!!! When you are OhTea like us, gravity, just works. WIN!!!! One day I needed some cash to take advantage of a super special deal. It was a buy one box of washing powder for the price of two and get the second box ABSOLUTELY FREE. So, I rushed off to the ATM to draw some cash. Now, I think you would think that finding such a deal was the OT win but no, it wasn't. When I got to the ATM, there was a queue of WOGs waiting to draw cash. But I couldn't wait because I "tele - pathetically" sensed that the shop was going to run out of stock and I wouldn't get that super special deal. I made a decision right then and said "NO! ", That specials is mine alone. Next moment, the elderly, frail old women in front of me in the queue, froze in time. She just turned into a statue as the ATM became available. Using my super quick reaction time (which became even more sharp after Super Power) I powered my way past that WOG and drew my cash from the ATM. When I was finished, she came back to life and shuffled towards the ATM which promptly shut down! Had I waited, I wouldn't have been able to drawn my cash!! Thanks to my new case level ( all hail COB!!) I was able to get my cash and also the extra box of washing powder!! Next moment, the elderly, frail old women in front of me in the queue, frozen in time. She just turned into a statue as the ATM became available. Using my super quick reaction time (which became even more sharp after Super Power) I powered my way past that WOG and drew my cash from the ATM. When I was finished, she came back to life and shuffled towards the ATM which promptly shut down! Had I waited, I wouldn't have been able to drawn my cash!! The person who'd invited me saw a perky young woman approaching with a clipboard and determined, registrar eyes. Knowing I was not a Scientologist, he frantically waved her off. Clearly, this proves I am a natural OT. *You don't even want to know.